Capel Coch, Llangefni, Isle of Anglesey. The hotel has been awarded the Visit Wales Gold Award from 2010-2105. Alongside this and for four years running has been the winner of the Best Large Hotel at the Anglesey Tourism Awards. Tre-Ysgawen Hall boasts a range of rooms and suites that cater to most tastes, whether you prefer double or single, traditional or modern décor. All rooms have great views of the courtyard, the front lawn or the Snowdonia Mountains, and are designed to ensure that your stay is as comfortable as possible. With twenty nine rooms to choose from, you’re sure to find your kind of room here. 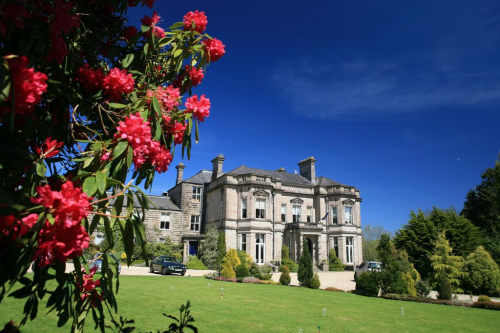 Set in acres of picturesque gardens, meadowland and woodland, Tre Ysgawen Hall, which won the prestigious Best Restaurant accolade at the 2013 Anglesey Tourism Awards is an outstanding venue to relax and enjoy an evening meal. Located in the centre of Anglesey you are never too far from any of the fantastic and varying golf courses the island has to offer. While golfers are always welcome, non-golfing partners may also wish to stay and relax in our luxury and award winning spa offering a true alternative to carrying the clubs!